A wood-burning stove (or wood burner) is a heating appliance capable of burning wood fuel and wood-derived biomass fuel, such as wood pellets, and multi fuel (coal, wood, even peat). 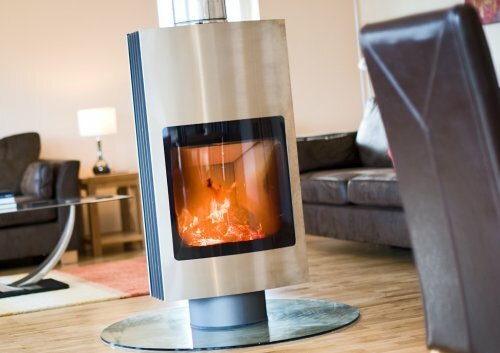 The stove is connected by ventilating stove pipes to a suitable chimney or flue, which will fill with hot combustion gases once the fuel is ignited. The chimney or flue gases must be hotter than the outside temperature to ensure combustion gases are drawn out of the fire chamber and up the chimney. 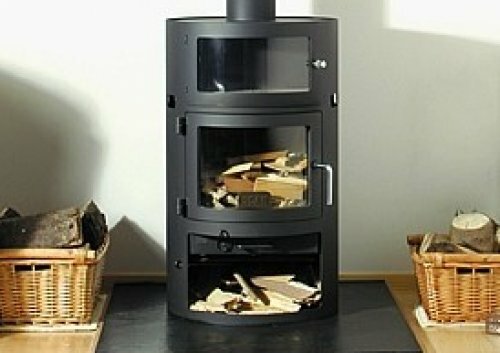 Many wood-burning stoves are engineered such that they can be converted to multi fuel stoves with the addition of a grate. Keeping the air flowing correctly through a wood-burning stove is essential for safe and efficient operation of the stove. Fresh air needs to enter the wood compartment to provide oxygen fuel for the fire; as the fire burns, the smoke must be allowed to rise through the stove pipes, and exit through the chimney. To regulate air flow, there are damper devices built into the stove, flue and stove pipes. By opening or closing the dampers air flow can be increased or decreased, which can fan the fire in the wood compartment, or "dampen" it by restricting airflow and reducing the flames. The dampers can usually be accessed by turning a knob or a handle attached to the damper, found outside the stove or stovepipe. One of the uses of the dampers is to increase airflow into the wood compartment to raise flames and thus the temperature of the stove, to temporarily create a high heat for cooking. High heating efficiencies on closed appliances can only be attained by controlling the supply of air to the fire chamber (operating the air control correctly). It is not recommended to leave the air control fully open, except when helping the chimney/flue heat up initially. A fully open air control will lead to more heat being sent straight up the chimney rather than into the room (which reduces efficiency). The biggest problem with leaving the air control fully open is “overfiring”. Modern building techniques and standards have created more airtight homes, forcing many stove manufacturers to recommend that their stoves be installed with outside air intake. Outside air ensures that stoves will run more efficiently, and also removes the need for cold air for the combustion process to pass through the living space, thus reducing "draughts", and improving comfort of the occupants. These designs are called "room sealed stoves" or "external air supply stoves. Multi fuel stoves designs are increasingly common. They burn solid fuels only (wood, coal, pellets, even peat) , and are typically made of steel or cast iron. Some models are also boiler stoves, with an attached water tank to provide hot water, and they can also be connected to radiators to add heat to the house. Costs will range hugely and the vast majority of this is due to the stove selection. Fully installed these can range from range from £2500 and up from there. When fitting to older building, this is likely to be more expensive than a new build so well worth having a detailed conversation about what is involved.